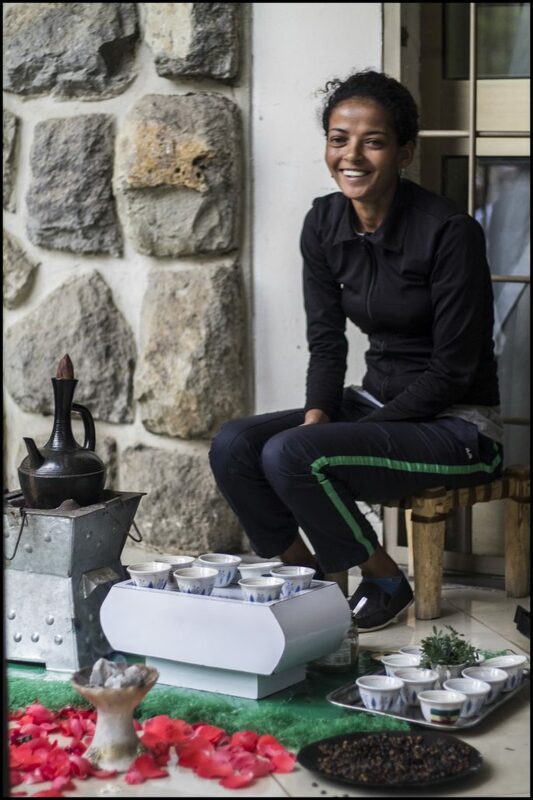 For the month that Cara lived in Addis before me, I slowly formed two different images of the coffee culture in my head. In both of them, coffee shops were on every corner and I can happily report that much is extremely accurate. In one version, these coffee shops were an assortment of stalls and storefronts proudly proclaiming that “bunna” could be found underneath the signage. In my mind, some had signs only in Amharic, run by greybeards with little more than a counter where the cups of joe would appear alongside a conversation and others would be modern joints with a front door and English menus. 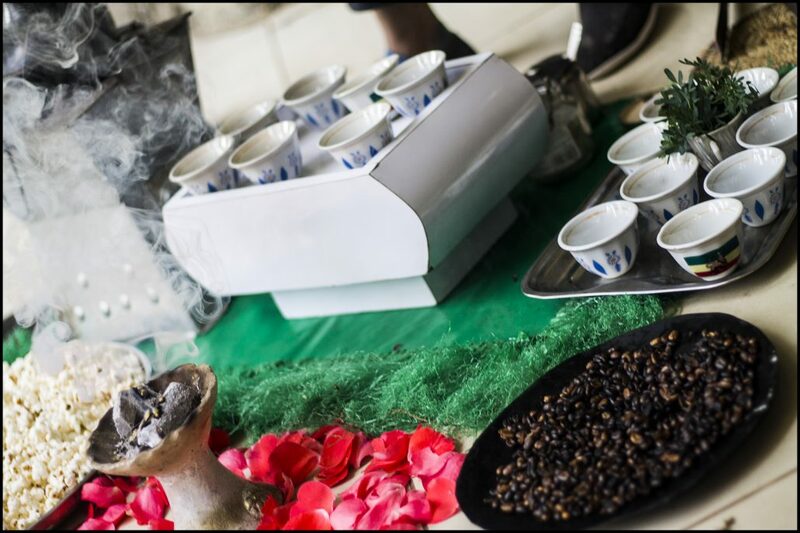 In the other version, the coffee shops were more like cultural assembly lines, where bunna ceremonies were constantly moving along with ornate trays of coffee and Ethiopian drinkers attached to each. In reality, both of these kind of exist and yet neither really does. To be sure, there are plenty of western coffee shops lining major roads in Addis, and a personal favorite, Kaldi’s (which I’m sure has no relation to the chain in St. Louis but nonetheless has my loyalty) is ubiquitous. But in the neighborhoods the coffee shops give way to structures that could be mistaken for homes or hair salons and awnings that stretch to the road, covering groups of caffeine consumers (usually men with female waitresses attending). There’s no screaming signage, yet everyone knows where to get their fix, as if the coffee exerts a force akin to gravity or something at a more quantum level. Coffee can hold the promise of a day’s potential in the same way that whiskey holds its memory. So while there are both western-styled coffee shops and neighborhood joints, I didn’t have a chance to participate in my first coffee ceremony until a few weeks ago. Peace Corps Ethiopia welcomed their new programming and training staff, including Cara, with a ceremony and I was invited to attend. After arriving and making introductions, staff ushered everyone outside to the back of the building where the green cherries were already being roasted on a small wood/charcoal stove. The aroma started off light, small flames, the roasting transforming an unfamiliar fruit into the brown beans I was used to seeing, and thready incense tying the smells together gently. 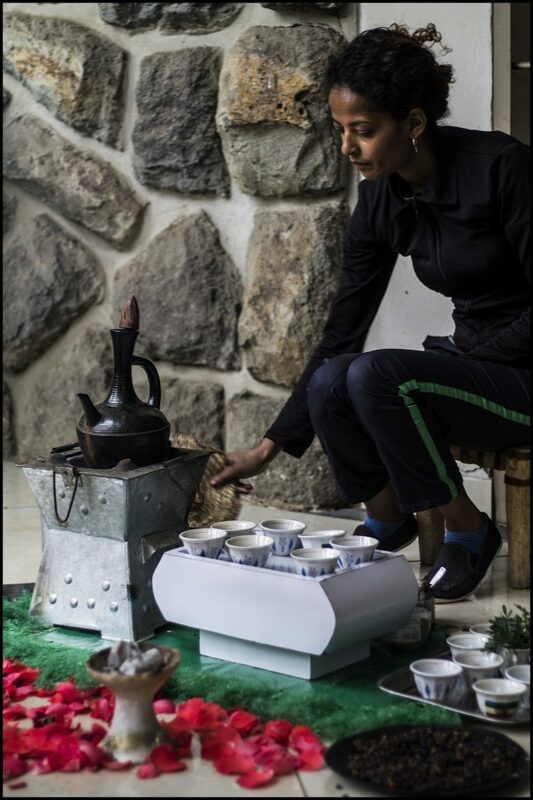 The small coffee cups were arranged on a tray or small table that I had seen in neighborhood bunna joints, called a “rakabot.” Once they were finished roasting, the beans were ground up and put into a clay coffee pot, or “jabana,” which had been filled with water and replaced the beans on the stove. As soon as the ground coffee was added, the smell of brewing coffee and espresso blossomed and filled the area. I was instantly taken back to Turkey, where the water and coffee would be heated together and you could watch the espresso bloom inside the copper cups. 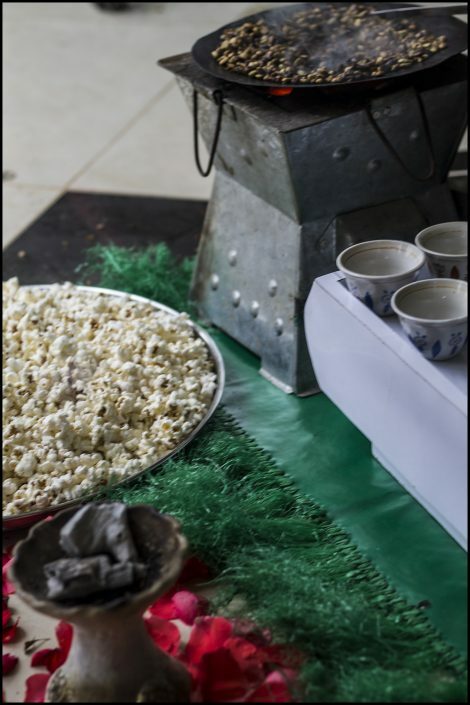 While we waited for the drinks to brew, female staff members brought around freshly popped corn (lightly salted, awesome), fresh chunks of bread, and Skittles for everyone to sample. Everything in the ceremony was done by women, by the way, even the grinding of the beans by hand. I don’t know enough about the custom to comment on it or the wonderfully strange spread of finger foods. As a side note, there’s a lot I’ll have to save for future posts about coffee. From the rather unique domestic production and consumption, to my growing list of the best beans, there’s a lot I still want to learn and share. I’m trying to keep these blog posts as more of first person stories, because I know there’s much to learn culturally and historically before I can provide much more context and background. 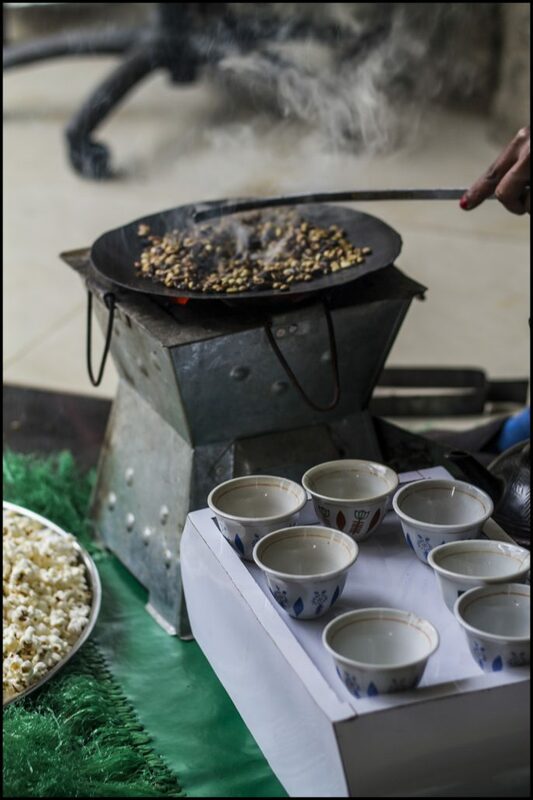 After much anticipation, though, the coffee was poured into the individual cups and distributed, and the taste! The taste was full of all my favorite parts—warmth, light, bitter, caramel and a heavy sugary sweetness underneath it all. It made me think of how coffee can hold the promise of a day’s potential in the same way that whiskey holds its memory.